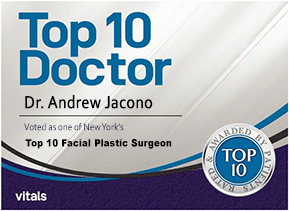 At the New York Center for Facial Plastic and Laser Surgery, Andrew Jacono, M.D. performs Reconstructive Facial Surgery to help individuals overcome physical limitations placed on them by circumstances beyond their control – facial deformities at birth, deformities due to cancer of the head and neck, and facial anomalies due to trauma. 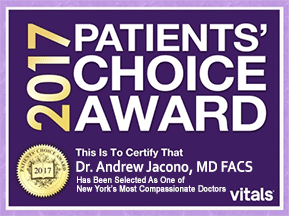 Doctor Jacono is part of Face to Face (Click here to learn more) and is one of a small group of Facial Plastic and Reconstructive Surgery Specialists who volunteer their time to perform Reconstructive Surgery on women who are victims of domestic violence pro-bono. 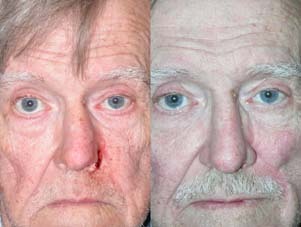 The photographs that follow are graphic, but help demonstrate how reconstructive surgery can help restore normal facial appearance and function. They are actual patients of Doctor Jacono’s and have not been altered for presentation here. Mohs Reconstruction Surgery Patient 1: Upper Lip Defect Reconstruction. Patient underwent a bilateral transposition flap. borrowing cheek skin to reconstruct the upper lip. 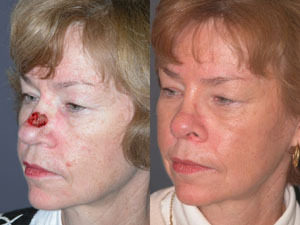 Mohs Reconstructive Surgery Patient 2: Nasal Defect Reconstruction with Multiple Staged Repair. This defect required a two staged surgery using a pedicled (stays attached to the donor site) paramedian forehead flap. The second stage involved sectioning the flap attachment. Mohs micrographic surgery (MMS) is a surgical technique in which minute layers of skin tissue are meticulously removed and examined under a microscope. By removing thin layers of tissue in this incremental manner, the physician can be sure that all involved tissue is excised, and can simultaneously spare healthy tissue. Of all the surgical techniques available today, Mohs surgery offers both the lowest recurrence rate of malignant lesions, and maximum preservation of healthy tissue. 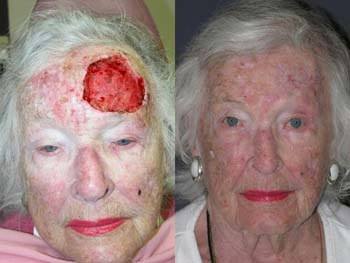 Mohs surgery is performed by specialized Dermatological Surgeons who only perform skin cancer removal, and then refer patients for reconstruction to a Facial Plastic Surgeon such as Doctor Jacono. Mohs surgery is more time consuming and expensive than traditional excision. 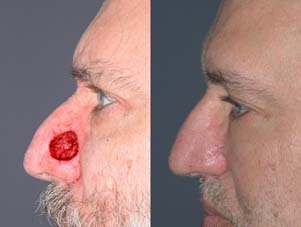 However, its precision is especially valuable for recurrent or aggressive carcinomas, for treatment of cosmetically important areas such as the nose, eyelids and lips, and for high risk and invasive lesions (such as near a facial nerve). 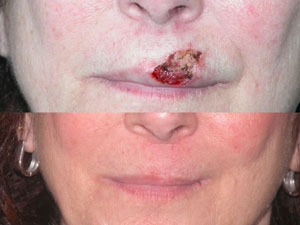 Mohs surgery is now frequently used to remove basal cell carcinomas, squamous cell carcinomas, and other lesions on the face. After a malignant lesion is removed with Mohs surgery, a depression or hole in the skin remains. 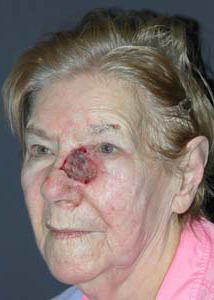 Such scars may be rather disfiguring, and reconstructive surgery may be performed immediately after Mohs surgery to repair the damaged site. Dr. Jacono specializes in carefully reconstructing the facial tissue in such patients, restoring their skin’s natural appearance. Mohs Reconstruction Surgery Patient 3: Nose and Eyelid Defect Reconstruction. Nasal Defect Reconstruction with Multiple Staged Repair. This defect required a two staged surgery using a pedicled (stays attached to the donor site) paramedian forehead flap. The inside of the nose was repaired with a septal flap, and cartilage was borrowed from his ear. The second stage involved sectioning the flap attachment. Patient underwent a two staged pedicled (stays attached to the donor site) Hughes Flap borrowing cartilage and skin from the upper eyelid. Mohs Reconstruction Surgery Patient 4: Nose Defect Reconstruction. This defect required a two staged surgery using a pedicled (stays attached to the donor site) cheek flap and ear cartilage graft to reconstruct the natural curvature of the nasal rim. The second stage involved sectioning the flap attachment. After your Mohs surgery is complete your dermatologist will bandage the wound and send you to Doctor Jacono’s office. This can be done the day of surgery or the following day. Once the bandage is removed and the defect is assessed, the proper reconstruction will be chosen. Most defects can be repaired with skin flaps. 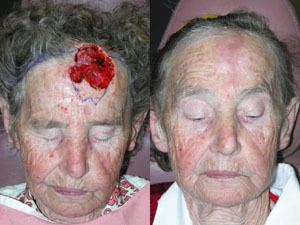 A skin flap utilizes local redundant tissue and advances or ‘flaps’ it over to cover the Mohs defect. 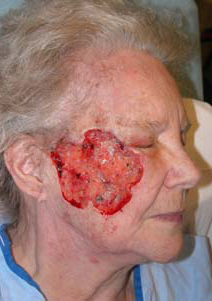 When appropriate, when the skin color and texture matches, a skin graft may be employed on certain parts of the face. A skin graft involves removing a piece of skin from a donor site and then sewing it into the Mohs defect. Donor sites are typically chosen from areas with excess skin in inconspicuous locations, such as behind the ear. Care must be taken with skin grafts, because if chosen to treat the wrong defect site, the repair can appear “patched” and unnatural. Sometimes more complex or multiple staged reconstruction are required depending upon how much tissue is removed and whether other tissue such as cartilage and bone must be reconstructed and replaced. 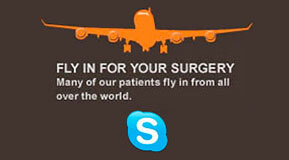 Doctor Jacono specializes in these more complex surgeries. Whether you have a flap or a graft, evaluation for possible further refinement with dermabrasion is performed at approximately the sixth post-operative week. 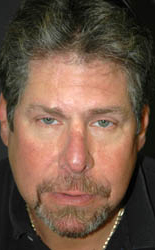 Mohs Reconstruction Surgery Patient 5: Upper Lip Defect Reconstruction. Patient underwent a bilateral transposition flap. borrowing cheek skin to reconstruct the upper lip. 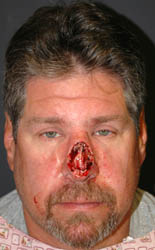 Mohs Reconstruction Surgery Patient 6: Nose and Eyelid Defect Reconstruction. Patient underwent a glabellar (forehead) transposition flap and cheek advancement flap. Mohs Reconstruction Surgery Patient 7: Forehead Defect Reconstruction. Patient underwent an Orotrichea Flap closure. 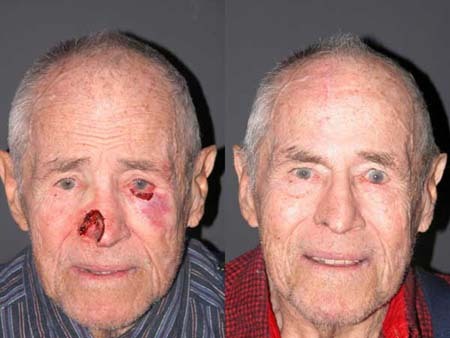 Mohs Reconstruction Surgery Patient 8: Forehead Defect Reconstruction. 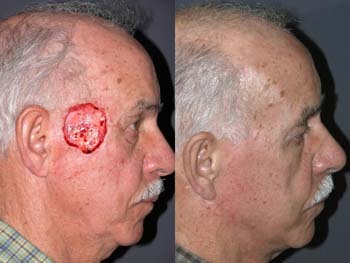 Patient underwent an O to T advancement flap, borrowing along the hairline. 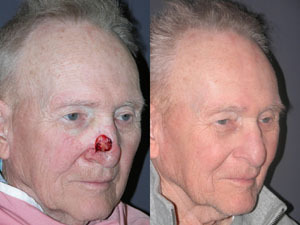 Mohs Reconstructive Surgery Patient 9: Nasal Defect Reconstruction with Multiple Staged Repair. This defect required a two staged surgery using a pedicled (stays attached to the donor site) paramedian forehead flap. The second stage involved sectioning the flap attachment. 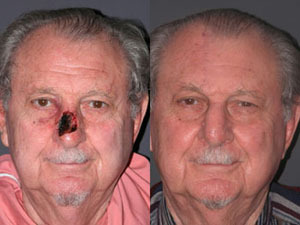 Mohs Reconstruction Surgery Patient 10: Cheek and Eyelid Defect Reconstruction. Patient underwent a neck transposition flap, and forehead and cheek rotation flap to close this large defect. 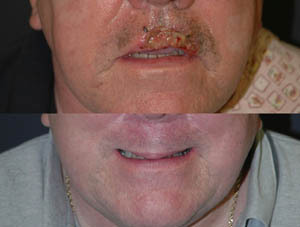 Mohs Reconstructive Surgery Patient 12: Upper Lip Defect Reconstruction. 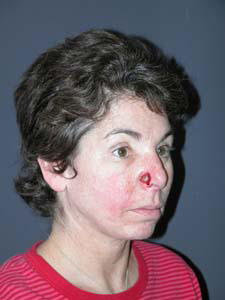 A nasal crescenteric lip advancement flap was utilized to reconstruct this defect of the lip. Mohs Reconstruction Surgery Patient 13: Cheek Defect Reconstruction. 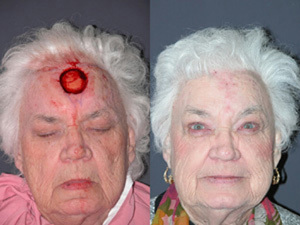 This patient had a cheek rotation flap for reconstruction in a single stage. 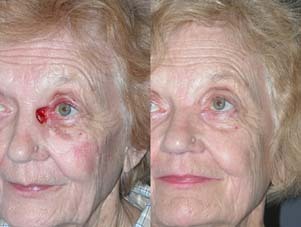 Mohs Reconstructive Surgery Patient 14: Eyelid Defect Reconstruction. A specialized flap called a tenzel flap was used to reconstruct the eyelid, and the lacrimal (tear duct) apparatus was reconstructed. A Tenzel flap borrows from the cheek skin. 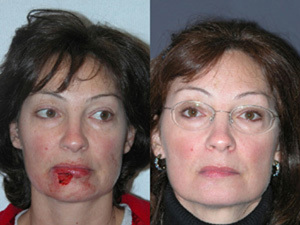 Mohs Reconstructive Surgery Patient 15: Lower Lip Defect Reconstruction. 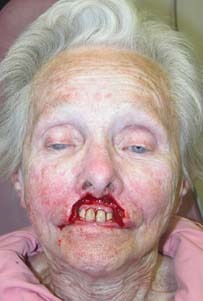 A vermillion lip advancement flap was utilized to reconstruct this defect of the lip. 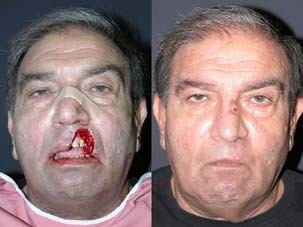 Mohs Reconstructive Surgery Patient 16: Nasal Defect Reconstruction with Multiple Staged Repair. This defect required a two staged surgery using a pedicled (stays attached to the donor site) paramedian forehead flap. The second stage involved sectioning the flap attachment. Mohs Reconstruction Surgery Patient 17: Forehead Defect Reconstruction. 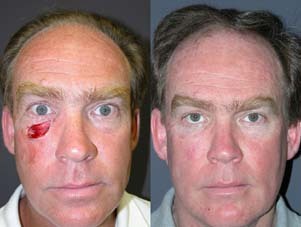 Patient underwent an O to T advancement flap, borrowing along the hairline. Mohs Reconstructive Surgery Patient 18: Full Thickness Upper Lip Defect Reconstruction. A nasal cresenteric lip advancement flap was utilized to reconstruct this full thickness defect of the lip. Mohs Reconstruction Surgery Patient 19: Eyelid Defect Reconstruction. A specialized flap called a tenzel flap was used to reconstruct the eyelid, and the lacrimal (tear duct) apparatus was reconstructed. A Tenzel flap borrows from the cheek skin. 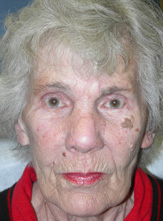 Mohs Reconstruction Surgery Patient 20: Cheek and Eyelid Defect Reconstruction. Patient underwent a neck transposition flap, and forehead and cheek rotation flap to close this large defect. 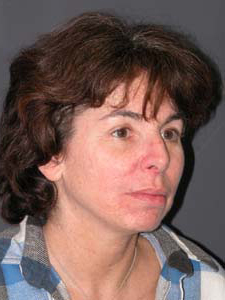 Mohs Reconstructive Surgery Patient 21: Nasal Defect Reconstruction. A Glabellar Flap was used to close this nasal defect and prevent alar distortion. 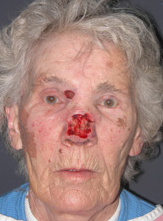 Mohs Reconstructive Surgery Patient 22: Nasal Alar Defect Reconstruction. This defect required a two staged surgery using a pedicled (stays attached to the donor site) cheek flap and ear cartilage graft to reconstruct the natural curvature of the nasal rim. The second stage involved sectioning the flap attachment. 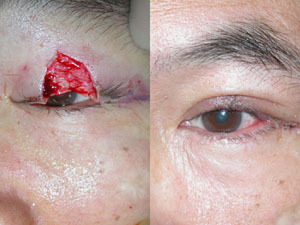 Mohs Reconstructive Surgery Patient 23: Eyelid Defect Reconstruction. A specialized flap called a tenzel flap was used to reconstruct the eyelid, and the lacrimal (tear duct) apparatus was reconstructed. 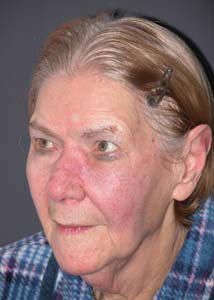 A Tenzel flap borrows from the cheek skin. A full thickness skin graft was also required. 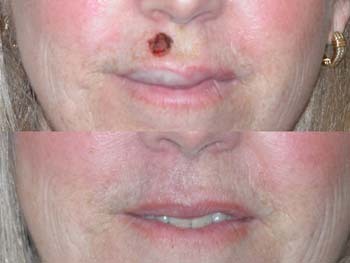 Mohs Reconstructive Surgery Patient 24: Full Thickness Upper Lip Defect Reconstruction. A nasal cresenteric lip advancement flap was utilized to reconstruct this full thickness defect of the lip. 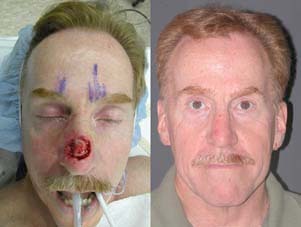 Mohs Reconstructive Surgery Patient 25: Nasal Defect Reconstruction with Multiple Staged Repair. This defect required a two staged surgery using a pedicled (stays attached to the donor site) paramedian forehead flap. The second stage involved sectioning the flap attachment. Mohs Reconstructive Surgery Patient 26: Ear Defect Reconstruction. 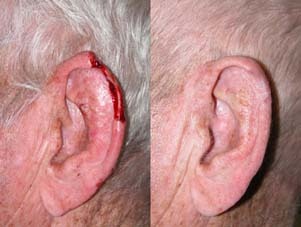 A chondrocutaneous V to Y advancement flap with a full thickness skin graft was used to restore natural contour to this ear. 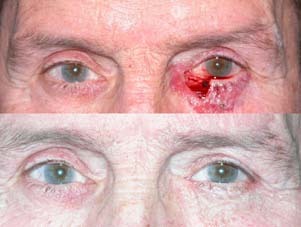 Mohs Reconstructive Surgery Patient 27: Eyelid Defect Reconstruction. 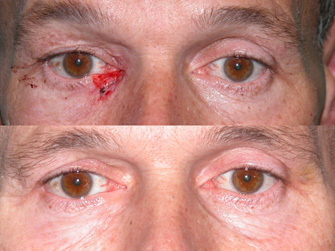 A glabellar (forehead) transposition flap was used to close this eyelid defect. 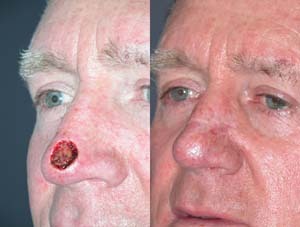 Mohs Reconstructive Surgery Patient 28: Nasal Tip Defect Reconstruction. A bilobed flap was used to close this nasal defect and prevent alar distortion. 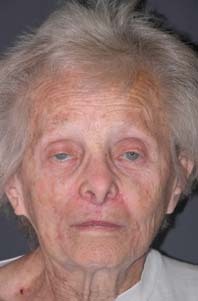 Mohs Reconstructive Surgery Patient 29: Nasal Defect Reconstruction. 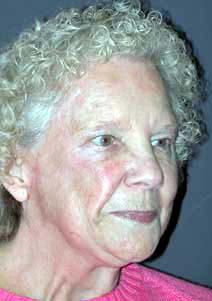 A single staged meloabial (cheek skin) transposition flap was used for reconstruction.